All the latest news and company announcements from NSG. A major milestone has been reached on the LLWR PCM Decommissioning and Demolition project with the transition of a magazine to C2 radiological classification. Magazine 10 is the first of four remaining magazines scheduled to be fully decommissioned and it is now possible to enter the magazine without any respiratory protection for the first time since the magazines were filled with PCM (plutonium contaminated material) waste over 20 years ago. This marks a major achievement for the project, which NSG has been delivering as part of an integrated team on the site for the last five and a half years. In this time, the facility has been transitioned from C5, the highest contamination-controlled area classification, to C3 and now finally C2, where only a pair of overshoes is required to enter in addition to the standard ‘Site Basics’ clothing. The decommissioning activities undertaken by the project team to achieve this milestone have been vast and included some significant challenges. A number of the tasks have involved closely managing significant risks in terms of conventional safety whilst working in high hazard contamination-controlled areas. The team have worked vigilantly to complete all tasks safely and have delivered all the decommissioning scope without a single lost time accident. Thank you for thinking of us as a potential employer. Unfortunately, we do not have any vacancies available at the moment, but please check back with us at a later date. Last week, NSG welcomed A-level student and chemistry enthusiast Dominic Jackson from West Lakes Academy for the Centre for Leadership Performance’s Dream Placement initiative. 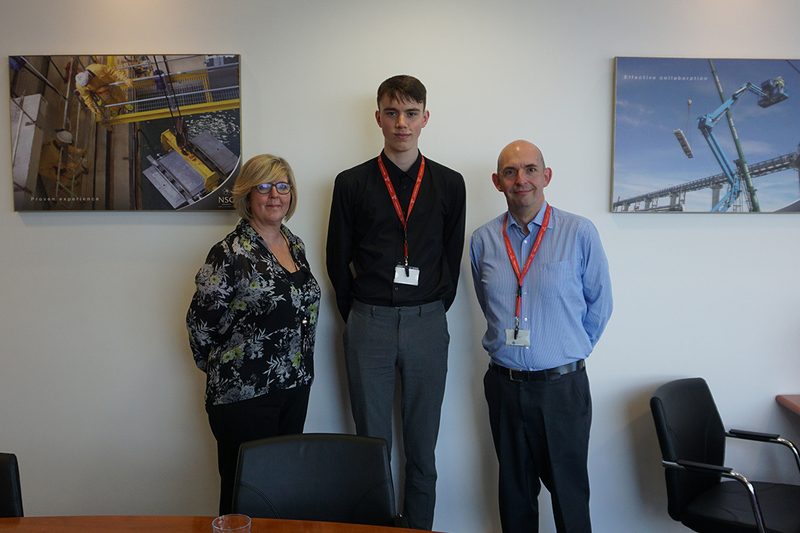 During his Placement Week, Dominic spent his first day at NSG’s head office in Chorley, where he interviewed Managing Director Jim Porter and learned about the nuclear industry. For the rest of the week, Dominic was based at the Low Level Waste Repository in West Cumbria and shadowed members of the NSG site team. Whilst there, Dominic attended project meetings; chatted with engineers, project managers and planners to gain an insight into the different office-based roles; supported the project team with data collection and other project tasks; and received a bespoke tour of the site to witness operations. It was great to have Dominic with us for the week and we hope he had an enjoyable and educational experience. There are lots of exciting career opportunities available in the nuclear industry and Dream Placement enables students like Dominic to experience them first hand. Dominic’s Dream Placement will conclude at the Showcase Event at Energus in Workington in late March, where he, Lesley and the rest of the participating students and company representatives will get back together to discuss their Dream Placement experiences. 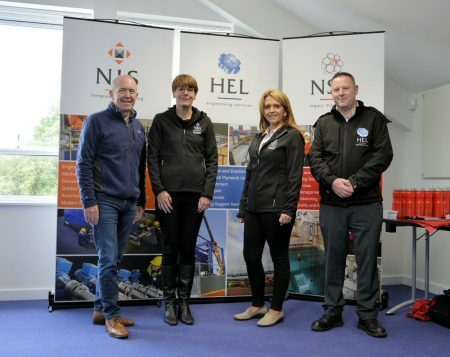 On Saturday 15 September, the NIS Group of Companies (NSG, NIS and Hold Engineering) proudly supported the Wasdale Mountain Rescue Team as it moved into a new £650,000 purpose-built base in West Cumbria. In recognition of the milestone, both NSG and NIS made significant contributions to the fund, while Hold Engineering designed and built lockers for the team’s new mess room. Wasdale Mountain Rescue Team, one of the Lake District’s busiest mountain rescue teams, has been assisting people in the western fells of Cumbria for 50 years. The team comprises 40 volunteers/base operators and each year responds to around 100 emergency calls from the police to rescue people who are injured or lost in the local mountains. The team also assists other organisations when requested and in December 2015 helped to rescue people affected by the severe flooding caused by Storm Desmond in Carlisle. Since the late 1960s, the team has been based in Gosforth, near Sellafield — most recently in makeshift buildings behind the village’s Kellbank Hotel. Now, after a four-year funding campaign, the new base is located nearby on the opposite side of the A595 on land owned by the Nuclear Decommissioning Authority (NDA). The new facility includes a training tower, a retractable 60ft radio mast and a control room. NSG Environmental Ltd is delighted to announce it has been shortlisted in two award categories at the Britain’s Energy Coast Business Cluster (BECBC) Awards 2018. The company has been shortlisted in the SME Innovation and Creativity category for its use of an innovative combination of Nochar absorbent and cementitious grout for the disposal of radioactive liquids and oils at various sites around the UK. NSG has also been shortlisted in the Collaboration category for the success of its integrated site team approach with LLW Repository Ltd, as well as supply chain partners Nuvia, PC Richardson, Hertel, Orano, KDC and Squibb. The awards ceremony will take place on Thursday 22 November at Energus in Workington, where NSG will join the other shortlisted companies and BECBC members and supporters to celebrate the excellent work delivered by Cumbrian companies over the previous twelve months. NSG Environmental Ltd is delighted to announce it has been awarded a framework agreement for Design and Engineering Services by Dounreay Site Restoration Ltd. The scope of the framework includes environmental cases and restoration, design and engineering services, construction management, waste strategy documentation and technical support. Under the banner of COSMIC+, NSG will deliver the work in collaboration with Alpha Engineering, ARC, GD Energy Services, MMI Engineering, NIS, North West Projects, Quintessa, TÜV SÜD Nuclear Technologies, Vulcain Engineering and Westlakes Engineering. As we embark on a new journey with our collaborative partners in the COSMIC+ team we look forward to supporting Dounreay, which is recognised as one of the most complex nuclear decommissioning projects in Europe. On Thursday 17 May, NSG enjoyed a successful evening at the annual North West Employee Engagement Group (NWEEG) Awards at Ribby Hall Village in Preston. Lead Consultant Aimee Rodgers took home the Eureka Award, awarded to someone who “generally works under the radar yet has a spark of brilliance about them”, while Group Shared Services Manager Wendi Barnes collected the Health and Wellbeing Award. NSG’s Director of Consultancy Services Michelle Wise was also shortlisted for the Most Magnetic Manager Award. To top off an action-packed and fruitful evening, NSG were also awarded third place in the ‘Best of the North West’ 2018 survey. A huge congratulations to Aimee, Wendi and Michelle on their thoroughly deserved awards and nominations, which are testament to their passion for their roles and the company. In addition to the individual awards, to be recognised as one of the most engaging places to work in the North West from our employee survey results is a fantastic achievement and I am immensely proud to collect the award on behalf of the entire NSG team. On Saturday 12 May, an eleven-strong team of NSG employees completed the Manchester edition of Born Survivor to raise money for NSG’s chosen charity Derian House. 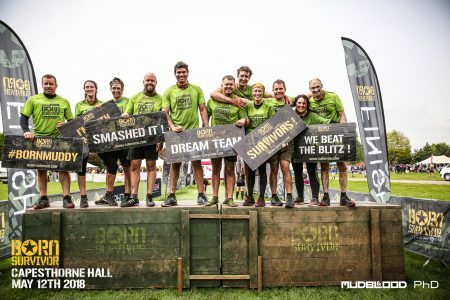 Set in the grounds of the magnificent and muddy Capesthorne Hall in Cheshire, #TeamNSG crossed the finish line of the 10km obstacle course together in just under three hours. So far, the team have raised over £500 for the Chorley children’s hospice, smashing their original fundraising target of £300. NSG Environmental Ltd is delighted to announce it has been awarded Cyber Essentials PLUS accreditation. A primary objective of the UK Government’s National Cyber Security Strategy is to make the UK a safer place to conduct business. Cyber Essentials is a cyber security standard that uses independent assessment to identify the security controls that an organisation needs to have in place within their IT systems in order to have confidence that they are addressing cyber security effectively and mitigating the risk from internet-borne threats. Our Cyber Essentials PLUS accreditation, together with our IASME Gold certification, demonstrates to our clients and supply chain partners that the information they entrust to us is safe in all practical respects. This is a major achievement for us and a true testament to the efforts of the NSG team to achieve this standard. NSG Environmental Ltd is delighted to announce it has been awarded the RoSPA President’s Award for achieving 14 consecutive RoSPA Gold Awards. The accolade was awarded to NSG for consistently demonstrating exceptional health and safety performance. Members of the NSG team will collect the award at the annual RoSPA Health and Safety Awards presentation ceremony in Birmingham on Thursday 5 July. This award is testament to the dedication of all our staff who ensure that health and safety is paramount in all we do. I would like to thank them for their ongoing commitment to safe working and look forward to celebrating our achievement with the other winning companies in July.